Winter driving can be risky and sometimes dangerous, but that doesn’t really stop the extremely determined folks, does it? No, some of us see that low-traction powder blanketing the familiar landscape and a newfound sense of adventure washes over us. Last week, I asked you guys for your craziest winter driving stories. I was looking for skids, spins and general mayhem. You guys sure as hell delivered. 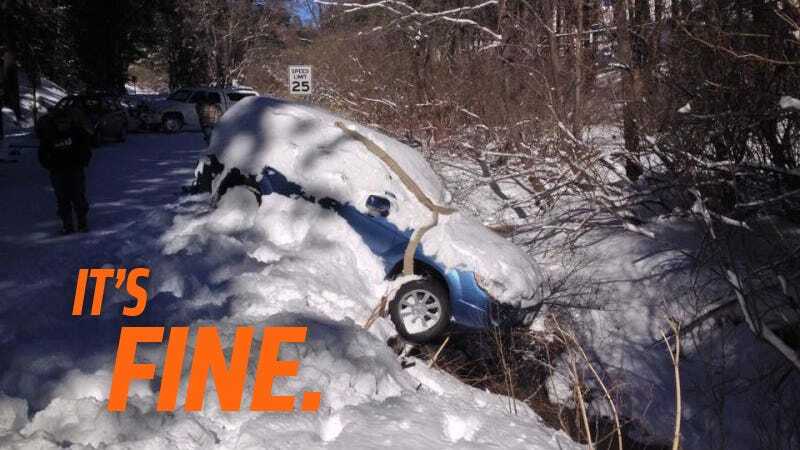 What&apos;s The Most Insane Thing You&apos;ve Done In Your Car During Winter? Also, just remember: if the cop asks, you’re just testing out your car’s handling capabilities in bad conditions. The more dangerous the more fun. My friends found a couch, too, except they used it to sit on. One less Cavalier on the road. I feel like people should check these things beforehand. I want this tree gone NOW! Where did that gash come from? It makes you a drift god. And some satellite dish fun. Wouldn’t be a good winter post without some extra Canadian input. What&apos;s Your Closest &apos;Running On Empty&apos; Story?